It's July 27th and day 73 or our Cross Canada Trip. We take an early morning hike along the sea walk, listening to the church bells ringing. We see a sign on the church, the building is dating back to 1790. Later we break camp and head in direction of Percé and Tête d'Indian. We drive through some beautiful country side with lots of small quaint villages which are all called Percé ... something. Sure wish my French was a little better. We stop at one of the small villages and pick up some local salted air-dried cod... Wow this stuff is salty, more on this later. As we drive north-eastward the fog is rolling in and it gets pretty thick in places. Driving through Percé it is hard to make out anything but the road. 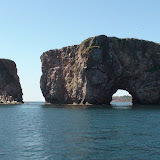 Percé is located on the tip of the Gaspé Peninsula in the Gulf of Saint Lawrence. Rocher Percé coming out of the fog. Eventually we arrive at Tête d'Indian Campground. It is OK but not exactly what we were hoping for. Some of the campsites up on the hill side will have nice views of the Gulf of St Lawrence. We do have full service which is nice. Wish we had one of these sites. With enough Mayo it should be OK? Once we get set up we try some of this famous salted air dried Cod. One is supposed to have it with beer. Just so you know, you will need more then beer!!! Eventually after a few tries of savoring this salt mine, we give up and cook supper. It's been a long day and the bed looks pretty good. When we wake in the early morning of the 28th of July, day 74 of our journey, we are greeted with wonderful sunshine, not a cloud in the sky and calm seas. This is a good day for taking a boat tour past Rocher Percé and to circumnavigate Parc National de I'Île-Bonaventure-et-du-Rocher-Percé. Rocher Percé and Parc National de I'Île-Bonaventure-et-du-Rocher-Percé in the distance. We get into our truck and drive the windy road back to Percé. We find a nice young man guarding a make-shift parking lot. $10.00 for the day is the price, and since we are the first people there, we have a look at where the sun is and where there will be shade. We get a nice spot. It will be very hot today. We wander the streets, there is really only one main street. We find one of the several boat tour companies that offers us a ticket for the next sailing. Before you know, we are on the "tug" and heading out direction Rocher Percé. These boat tours are only available from May to October. Liz with Rocher Percé in the back drop. On our way out.... The weather could not be better. Rocher Percé or Percé Rock is a huge sheer rock formation off Percé Bay. Percé Rock looks like a ship under sail from a long distance. This rock formation is just over 1km long, 90 meters wide, 88 meters high with a 20 meter arch. It is one of the world's largest natural arch located in water. It is further considered a natural icon of Québec and a major attraction. If the weather is good, don't miss it. Our cameras are working overtime, I'm sure we have over 300 pictures of this rock and half an hour of video. We will have to do some serious selecting when back in camp. Next we circumnavigate Parc National de I'Île-Bonaventure-et-du-Rocher-Percé. The park was created in 1985 to protect the large migratory bird sanctuary found on Bonaventure Island, as well as nearby Percé Rock. The park's area covers 5.8 km², only a small portion is located on the mainland. Approaching Parc National de I'Île-Bonaventure-et-du-Rocher-Percé. Liz at Parc National de I'Île-Bonaventure-et-du-Rocher-Percé. Northern Gannets on Parc National de I'Île-Bonaventure-et-du-Rocher-Percé. The island Parc National de I'Île-Bonaventure-et-du-Rocher-Percé features five incredible hiking trails. Park wardens and naturalists also offer guided bird, fossil and geology walks. This is where my favourite birds "The Northern Gannet" hang out. There are about 60,000 couples that make the Island their nesting ground. This is the larges colony in the world. Gannet pairs may remain together over several breeding seasons. They perform incredible greeting rituals at the nest. They stretch their bills and necks toward the sky and gently tapping bills together. The Northern Gannets are spectacular divers, plunging into the ocean at very high speed. Before striking the water they completely straightened out like an arrow. It is really something to watch. If a fish is taken during the dive, the Gannet usually swallow the fish underwater. Why did everyone leave me? Lunch and shopping is on the agenda when we return to Percé. After a great lunch we go for a hike, do some more shopping and then back to camp. Tomorrow we are off to Forillon National Park of Canada. For more pictures of this part of our trip click the image below, or go directly to the slide show here.